The QRS represents ventricular depolarisation and occurs through His-Purkinje fibres which have rapid conduction capabilities. Normal conduction takes less than 0.12s (three small squares) and any prolongation of this duration represents conduction block in the His-Purkinje system. These fibres divide to overly the left and right sides of the heart, forming two main bundles – the left bundle and right bundle – hence the phrase bundle branch block. 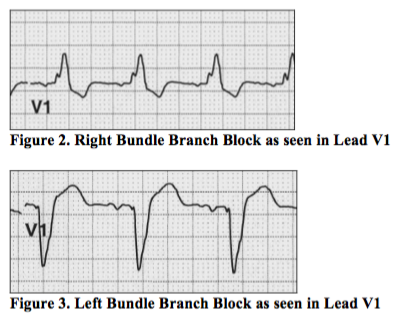 Establishing whether an ECG shows left or right bundle branch block is straightforward. In the context of normal sinus rhythm, if the QRS width is greater than 0.12s we only need to examine lead V1 of the chest leads on the ECG. If V1 is predominantly an upright structure as in figure 2, then you are looking at right bundle branch block (RBBB). Whereas, if you are looking at a predominantly downward structure, it is left bundle branch block (LBBB).